We decided over a year ago to limit our use of sulfates, especially in skin and hair care products. Why? Sulfates are harsh and drying and some say they're carcinogens (the evidence here is murky, at best). With dry skin and curly hair, the last thing I need is a harsh, drying ingredient in my soap & shampoo (more on that later). I thought I was in the clear. I couldn't find any "ingredients" so took the "Glycerin Soap" at face value. 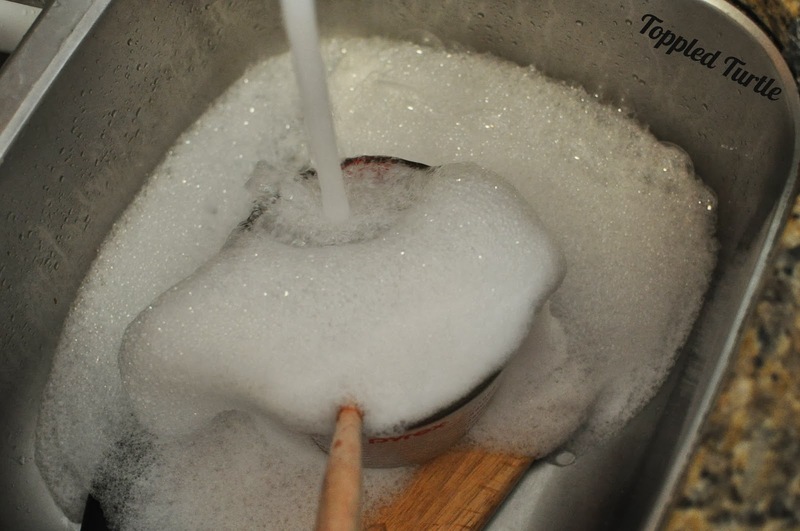 I even made up a batch of the soap and tried it out, but something seemed off (i.e. my skin felt drier than it had when I was using the soap from the Farmer's Market). So, I read over the label again and found it....the smallest writing on the entire packaging that has, admittedly a lot of text. See it, there? I underlined the fine print, for your sake - sulfates x2. Out of local options, I took to the internet. Enter Bulk Apothecary. 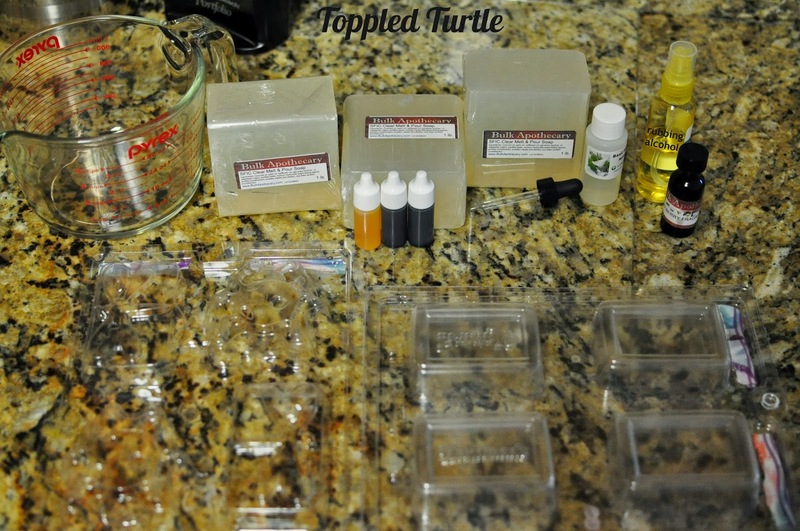 They have a large selection of raw materials, including many options for sulfate free melt and pour glycerin soaps. Each of their items has a clear list of ingredients - be sure to read them. They do offer Crafter's Choice (the same brand you'll find in craft stores, like the one shown above), so be sure you're buying what you think you are by reading everything. They also have lots of nicely concentrated, yummy smelling scents. Ok, so now you've got your supplies. How do you make the soap? Simple. Gather your supplies. 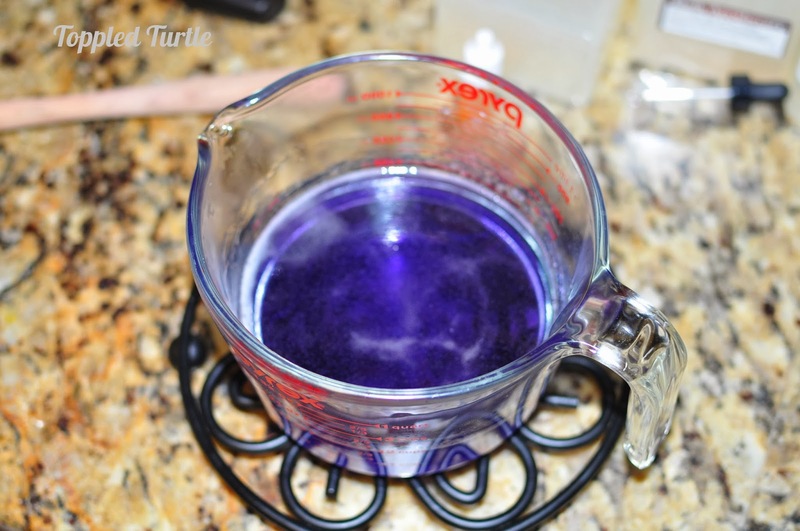 Pyrex measuring cup, glycerin soap (these are 1 lb bars), molds, colorants (optional), scents (optional), dropper, & rubbing alcohol. 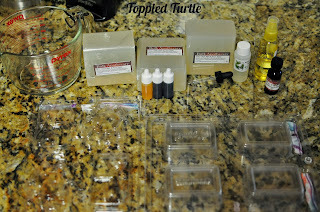 You can get most of this (except the sulfate free glycerin soap) at the craft store - don't forget those coupons! Step 1: Cut the 1 lb glycerin bar. I cut it into 6ths. You don't *have* to cut it, but if you don't, it takes longer to melt and ends up hotter. 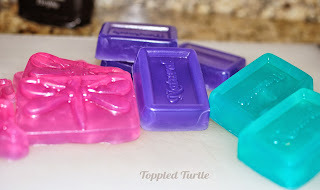 Hotter glycerin means you stand a risk of burning off the scent, but even worse, of melting your molds (if you have the cheap plastic ones like I have). Trust me, melting your molds is a messy situation. 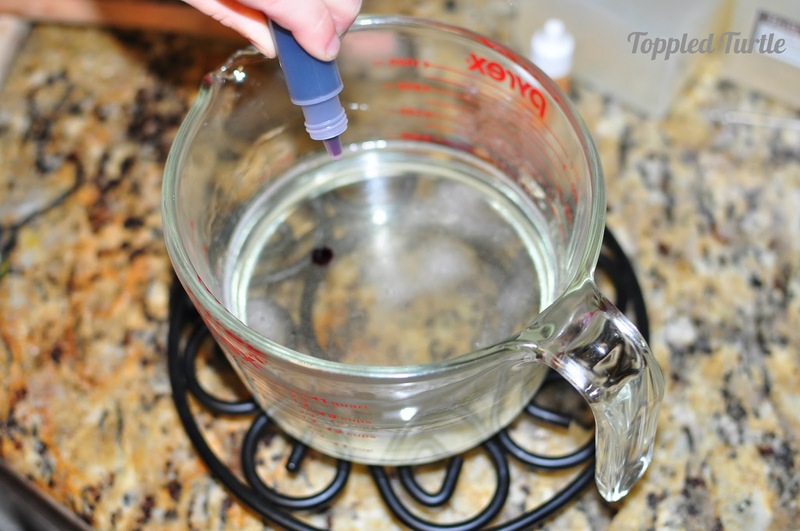 Step 2: Throw your pieces into a large pyrex measuring cup and put it into the microwave for 1.5 min. Swirl it around and nuke it for another 30 seconds or so. At this point, I prefer to just stir the melted glycerin until the last of it melts. (I might be afraid of melting another mold - maybe). Step 3: Add you color, if you opt to color your soaps. I like to color them because I make a different scent for me, hubby, and the kids. Colors make it easier to differentiate without having to take the additional time to print up labels. 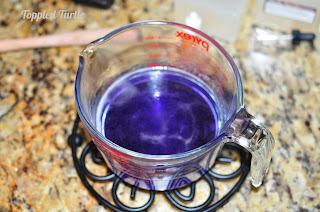 Adding your coloring in first allows the glycerin to cool off a bit before adding the scent, thus minimizing the risk of burning off some of the scent before you even have a chance to lather up in the shower. 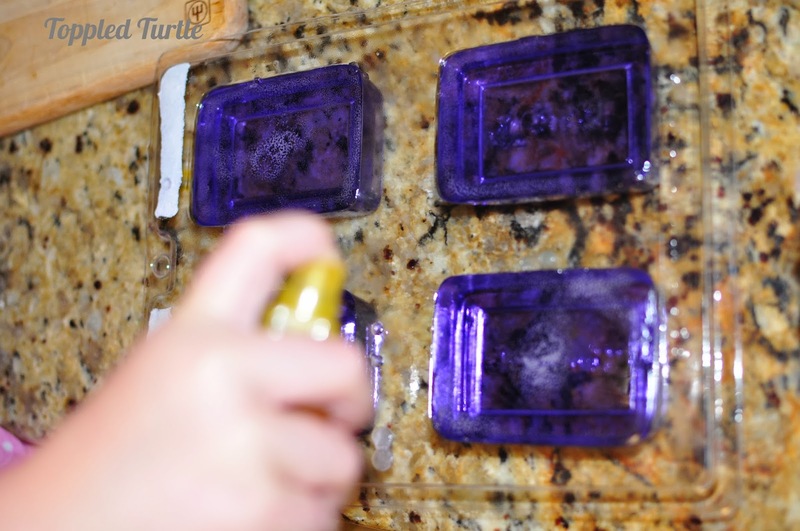 Step 5: Pour the melted, colored, and scented glycerin into your molds. 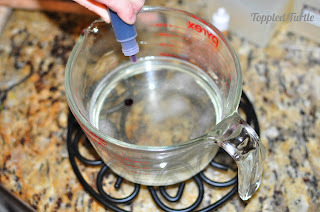 Here is where using a measuring cup to melt your glycerin comes in handy! 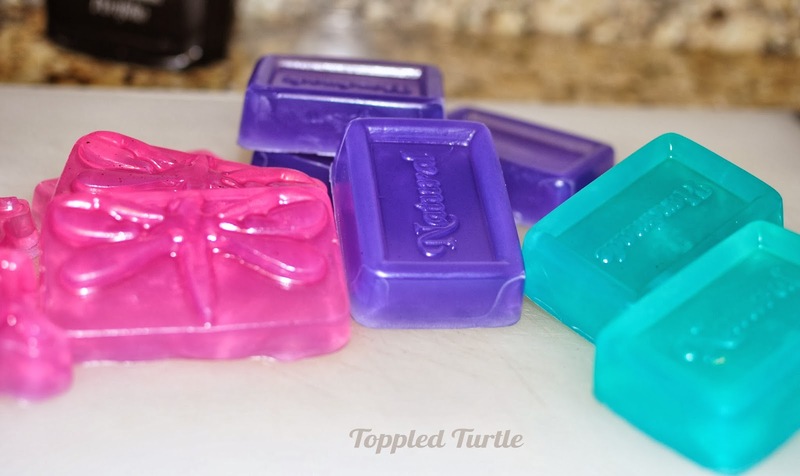 A 1 lb bar of glycerin almost perfectly fills a craft store mold of 4 bars. The mold will be brimming, and I tend to fill them to what appears full and then go back and top each of them off with the remainder. Step 6: Spray with rubbing alcohol. This pops the bubbles that will have formed on top of the bars and make your bars pretty. Step 7: Let it harden (1-2 hrs or so). 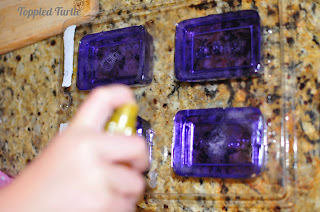 Release the soap from the mold by turning over and pressing on the bars out of the mold. Step 8: Let them cure overnight. This is probably not necessary, but I find it helps them harden. The next morning, you can wrap each of the bars in plastic wrap and store until needed. The plastic wrap will protect the bar from moisture while in storage. Now, unwrap a bar, hop into the shower or bath, and lather up. Enjoy that fabulous scent while your skin screams thank you! Oh, and feel free to donate all of those expensive lotions - you're not going to be using them much anymore. I don't think anyone will be complaining about lack of lather here, do you?